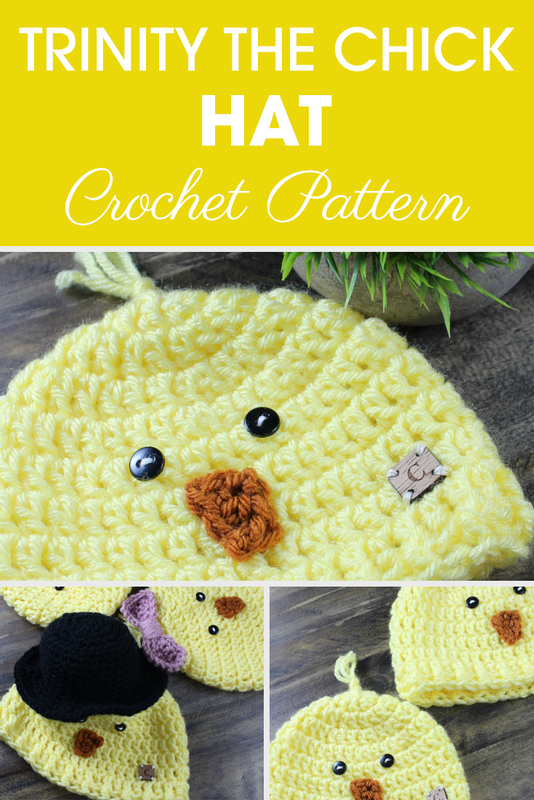 Trinity the Chick Hat is a cute and simple crochet pattern to make for Spring time. I love all the different options for this hat to add some personality. I’d love to see what y’all come up with and I hope y’all have fun! Starting with CA yarn, cut 3 strands of yarn 6″ long. Thread the yarn through a yarn needle and at the very top of the hat pull the needle through so that half the yarn is on one side and half on the other side. In other words, 3″ on one side, 3″ on the other side. Remove the yarn needle from the yarn. 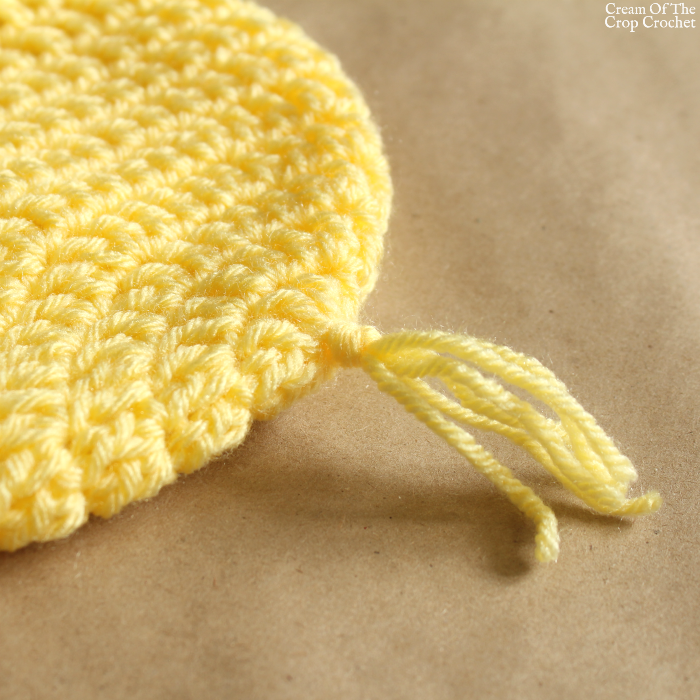 Now knot the yarn as close to the hat as possible. Trim the ‘hair’ down if you don’t want it to flop all over. With CB yarn and a yarn needle, attach the beak where you want the face to be. That would typically be the front, middle of the hat. Once you are done stitching around the beak, weave ends and cut yarn. This is where you will need the two black 1/2″ buttons, needle (not yarn needle), and white tapestry thread. 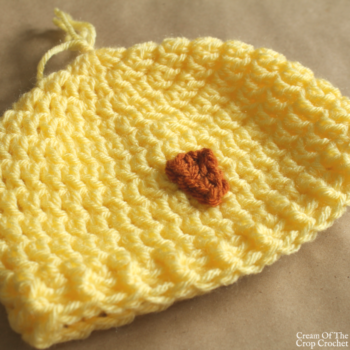 Place the buttons on the hat where you want them to visually measure it out. Attach the buttons to those places with the needle and white tapestry thread. Knot the thread in the back to secure it and weave it in. Cut any extra thread off. For the mini top hat I used this pattern along with CC yarn, J hook and a yarn needle. 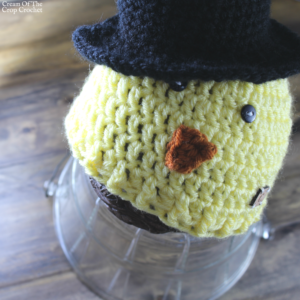 Then stuffed it with stuffing and attached the mini top hat to the hat. For the bow I used this pattern along with CD yarn, J hook and a yarn needle. Then attached it as shown in the photo below. Congrats! 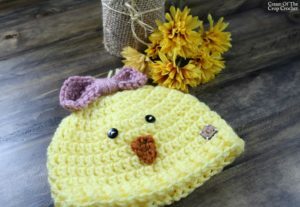 You have finished Trinity the Chick Hat.